PHOENIX – Only hours remain to apply for 2017 hunt permit-tags issued through the draw process for deer, fall turkey, fall javelina, bighorn sheep, fall bison and pheasant. All online and paper applications must be received by the department no later than 11:59 p.m. (Arizona time) tonight. Postmarks do not count. Applicants are encouraged to use the online service at https://draw.azgfd.gov/ (scroll down to “Apply for a Draw”). Purchasing a hunting license and filling out an application online is fast and easy. The online service also dramatically reduces the chances of making errors that could result in a rejected application. Paper applications now should be hand-delivered to any of the seven statewide department offices to ensure they are received by the deadline. For those who need assistance filling out an application, customer service representatives will be available at all statewide offices until 5 p.m. Online application assistance only will be offered from 5 p.m. to 11:59 p.m. by calling (623) 236-7424. Meanwhile, the department encourages applicants who apply online to purchase PointGuard. 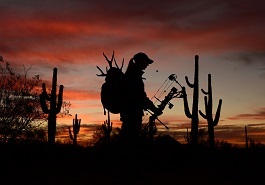 The newest benefit for AZGFD portal customers ensures that if a successful applicant is unable to participate in a hunt for any reason, the accumulated bonus points that were expended to draw that hunt permit-tag will be reinstated. All applicants need to sign up for a free AZGFD portal account to purchase PointGuard (visit www.azgfd.gov, click on the “My Account” button in the upper right-hand corner of the home page, then select the “Create Account” option). PointGuard is $5 per species, per applicant, purchased at the time of completing the online application, or prior to the application period deadline. For more information about PointGuard, visit https://www.azgfd.com/hunting/pointguard. Applicants who encounter issues related to PointGuard are encouraged to call the department at (602) 942-3000.